This card speaks of dishonourable gains, and thus the story of Helen of Troy and the Trojan Horse comes to mind. According to Myth Helen, queen of a Greek king, left him for someone named Paris of Troy. Helen was the most beautiful woman ever created, and her husband the king was enraged! The Greeks got together under the leadership of Agamemnon and laid siege on Troy to recover Helen from her lover, Paris. It is however widely believed by historians that this was an excuse to invade Troy motivated by greed for this was a very wealthy city indeed. Wealth that the Greeks coveted for themselves. After 10 years the Greeks had still not conquered Troy, so in an act of deception, they decided to leave a wooden horse outside the city as a ‘gift’ from the gods. The Greeks disappeared in their ships leaving the horse behind. The Trojans, firmly believing that this was indeed a gift from the gods, brought the horse inside the fortified city, not realizing that it concealed Greek soldiers inside its belly. Once inside the city of Troy the Greek soldiers snuck out and opened the city gates, a signal for the other Greek soldiers to storm the city from the outside. The result was that Troy was conquered. It was such a bold and cleverly deceptive strategy that in today’s modern world some computer viruses are named after this false gift, the Trojan. These viruses will apparently sit in-waiting on our hard-drive, undetected, sometimes for months before crashing our system. The lesson that today’s card brings warns us to be wary of false gifts, of people who give with one hand but take with the other. Such people may have the ability to make us feel ‘important’ by appealing to our ego or vanity, but the danger is that they often have ulterior motives and will ultimately betray us. We would be wise to be more discerning about whom or what we invite into our lives, as none of us want to be visited by a Trojan horse! While there is great wisdom and truth in the words of Eleanor Roosevelt who said: You have to accept whatever comes and the only important thing is that you meet it with courage and with the best that you have to give, we each have been blessed with the gift of discernment, a gift that we should remember to use when the little voice within cautions us that all is not as it seems. We most certainly do not walk through life in a state of perpetual paranoia, afraid that everything and everyone is ‘out to get us’, no, but we act wisely in the selection of our friends and energies that we invite into our lives. 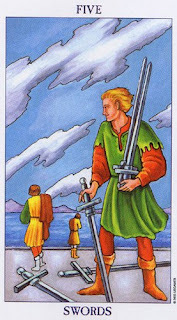 If nothing else, today’s card impresses upon us the importance to heed that little voice within, and to trust our intuition, even when – by all outer appearances – the gift we are offered may seem sincere and genuine. No harm can come from discernment, if anything we have been given this ability to protect what we hold dear from those who come bearing false gifts. Smile at the riddles of life, knowing that life's only true lessons are writ small in the margin.